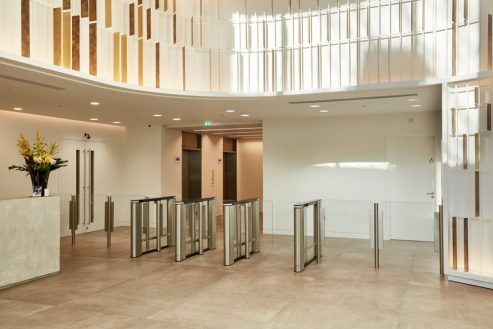 PRODUCT: EasyGate Elite SECTOR: Grade A Office CLIENT: Alder Castle LOCATION: London Alder Castle has recently undergone an extensive refurbishment, to provide 30,850 sq ft of high quality Grade A office space to the City of London. 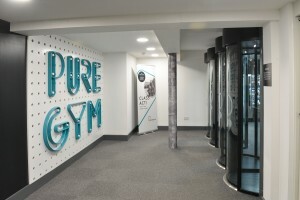 With its striking views across to St Paul’s Cathedral and great transport links, Alder Castle is a standout office development. 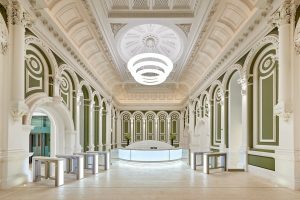 The building is approached via the refurbished link bridge to a double height reception with glass façade which is a key focal point of the redevelopment that gives occupants and visitors a stunning welcome. As well as providing high quality office space, the building offers terraces on the third and fifth floors and green spaces for staff to relax and admire the views across the city. 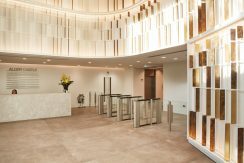 A bespoke light feature with bronze panelling creates a stunning reception entrance for which a modern and innovative entrance control solution was required. 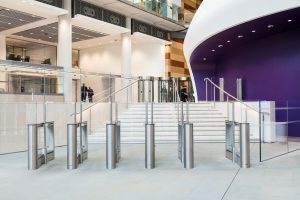 With years of experience delivering innovative entry control solutions, Meesons were approached to advise on possible solutions. 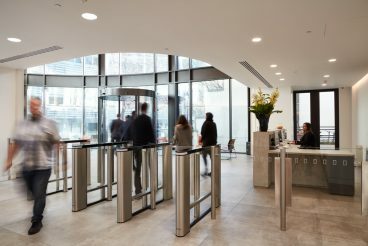 The client required a slimline speed gate solution that would secure the lift lobby whilst complementing the modern reception design. To cope with the expected throughput Meesons delivered three lanes of EasyGate Elite consisting of two standard width lanes and one wide access lane. With its elegant slim 120mm cabinet design and its minimal brushed stainless steel and glass construction the Elite delivers on both security and style. 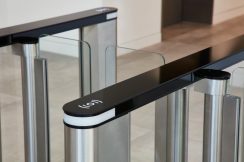 To complement the bespoke lighting within the reception area the speed gates were supplied with edge lights to provide users with visual guidance. 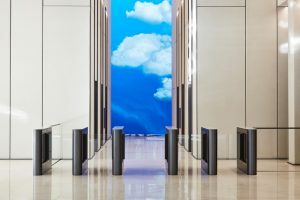 Bespoke floor mounted infill panels were installed to either side of the speed gate to create a secure line to the lift lobby. 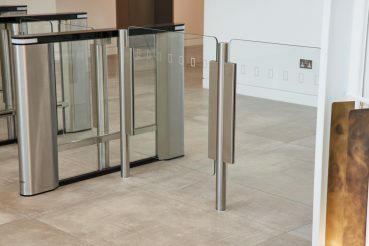 To maintain the aesthetics of both the speed gates and the glass infill barriers a brushed stainless steel hinge capping completed the minimal appearance covering the fixings between the posts and glass panels.